“Jacob’s Ladder in Genesis was a symbol of Grace, a connection between man and God. On a full-rigged ship, it is a way to the very highest portions of the masts. In both cases, climbing the ladder is a way of approaching the summit.” The church I sometimes attend on Nantucket island is beginning a search for a new rector and included this lovely sentence in a recent e-mail about the how the process is going. Which got me thinking….. But Rosenwald-related things are never far from my mind and I have been thinking recently about another Jacob — painter Jacob Lawrence who completed his Migration series of paintings while in his early twenties and benefiting from fellowships he received from the Rosenwald Fund in 1940, 41 and 42. The sixty panels currently reside in two places — half the panels at the Phillips Collection here in Washington, D.C., the other half in New York at the Museum of Modern Art (MoMA). Together, they present a sweep of history, the story the painter described as “an exodus of African-Americans who left their homes and farms in the South around the time of World War I and traveled to northern industrial cities in search of better lives.” Lawrence was, himself, a child of the migration, born in 1917 in Atlantic City, New Jersey to parents who came from Virginia and South Carolina. He based his paintings on stories he heard from relatives as he was growing up. Next spring that story will be on full display when all sixty will be shown at MoMA; in the fall of 2016 we will be treated to the same rare opportunity to see them all together here in Washington when they will be at the Phillips. 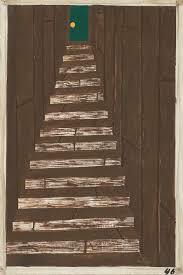 And how does the image of a stairway or ladder fit into the Migration series? Lawrence wrote (in the lovely picture book The Great Migration, an American Story),that “Although they were promised better housing in the North, some families were forced to live in over-crowded and unhealthy quarters.” The dark stairway could be in a tenement apartment or in a camp where laborers being recruited for factory jobs lived. It’s a somber image and yet, with the moon just visible at the top of the stairs and every rung going higher and higher, it’s hopeful too. I don’t know why the image in panel #46 appealed so strongly to Adele Rosenwald Levy, Julius Rosenwald’s daughter (and my husband David’s grandmother). It was the dark days of World War II and it’s possible it had something to do with events in Europe. It certainly is very different from the art David’s “Grandma” hung in her home — there were Van Gogh irises in the dining room. But I look forward to contemplating the question next spring, in New York, and again the following year here in D.C.